Quinces are a rare commodity in my area, so I bought 3 as soon as a small crop was put on display at my local grocery store. Then they sat in my refrigerator for a while until Doug asked if I was ever going to make anything with them. 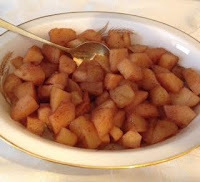 Once prodded, I decided to whip-up a quince-apple compote because I had both, and these work so well together in recipes. Fill a large bowl with water; add the lemon juice. 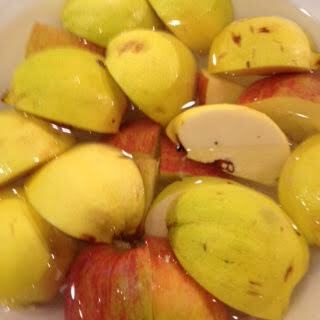 Quince and apple sections in lemon water waiting to be peeled and cored. Cut the quinces and apples into quarters; place the pieces you’re not working with in the water to prevent them from browning. Peel, core and cut each quince and apple section into 1/2 inch pieces. Return cut pieces to the water until all quince and apples are ready. Quince and apple pieces ready to be cooked. In the meantime, combine the honey and water in a large saucepan, bringing it to a boil. Reduce heat and simmer. 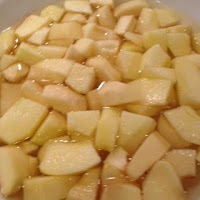 Quince and apple cooking in honey-water. 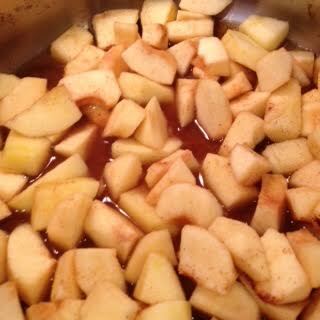 Drain the quinces and apples; add them and the 1/2 tsp. cinnamon to the pot of honey and water. Bring to a boil, cover, and reduce heat. Simmer for about 45 minutes, stirring often. 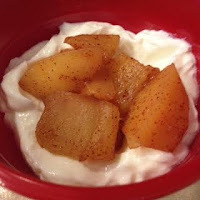 Quince-apple compote served over thick, plain yogurt! Serving: The compote may be served alone - either hot or cold, or better yet, over vanilla ice cream or plain or vanilla yogurt!